Last weekend our members went to Malmedy to cycle in the gorgeous Ardennes and even Luxemburg. After some struggles on the Friday ride to Malmedy, when some of us only arrived in complete darkness, we enjoyed a nice meal that was already waiting for the night riders. After we had a delicious meal and the hour was getting late, we went to bed to get some well deserved rest for the tour on Saturday that was looming on the horizon. That morning we set out to go on an adventure or just follow an already made route. Some of these tours were epic and very beatiful. 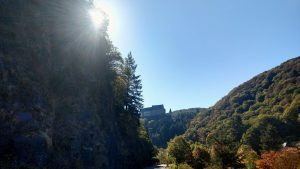 But with this kind of weather in October (25 degrees Celsius) how could one not go out on a long ride and enjoy the scenery and hills that the Ardennes and Luxemburg had to offer. When everyone arrived back home, some after more than 7 hours on the road, nice meals were already waiting to be eaten and energize our members. A part of the group went bowling, while the other part enjoyed other leisure activities. It was again a great evening, although not everyone got the rest they wanted for the ride back to Maastricht. The ride back on Sunday was one where the wind was finally in favour of our riders, thus it is only logical that the fast group managed impressive averages, and even the other groups had really impressive averages. To conclude, the weekend was a great one, and we really hope to do this again next year, preferably with the same weather. We also hope that this good weather stays for a while to create an Autumn to never forget. A huge thanks to all the sponsors and members that joined us to make this weekend cool. Hopefully until the next weekend in November or until one of the training sessions. ← Are you a student and interested in cycling? Join one of our open trainings!